How much does a Exhaust Manifold Gasket Replacement cost for your car? The cost of a Exhaust Manifold Gasket Replacement depends on the type of car you drive. The exhaust manifold takes burned exhaust from the engine’s cylinders and ejects them to remove them from the engine via the tail pipe. Made of either a set of pipes or cast iron manifold assembly, the gasket prevents leaks by sealing the surface of manifold to the cylinder head. As it deals with very hot fuel, it needs to contract and expand a lot, making it susceptible to wear. 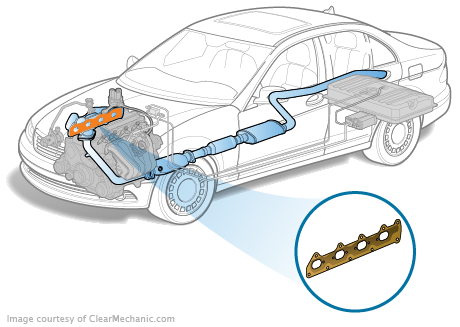 Like the exhaust gas recirculation tube, the manifold gasket is vital to make sure your car performs well and disposes of emissions effecitvely. The manifold being burnt or leaking in particularly can be dangerous as it can pollute the air with poisonous gases. If you smell any burnt plastic or noxious fumes, call a mechanic for an inspection immediately and do not drive your car to protect your health.